This is not right. 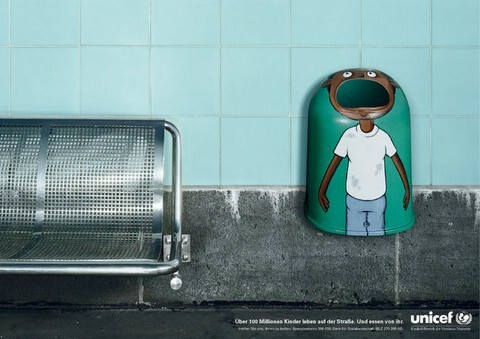 Sure, the message in this Unicef ad appears to be "don't be wasteful with food and other items because there are needy people in the world who need things" but an open mouth on a what appears to be a trashcan open wide, ready to have trash stuffed in. Wrong message. Very wrong. It's 12:30pm Sunday at the New York Hilton and you'd never know ad:tech New York 2005 was starting tomorrow morning. The exhibit hall looks like a large warehouse with boxes, crates and dollies all over the place being swiftly moved by crews racing the clock to be ready for the 6,000 who will descend upon the Hilton as the show opens. While checking out the layout of things, we stumbled upon a crew of 20 or so preparing the attendee bags which will be handed out to all who show up. As is usually the case when people do the same thing 6,000 times in a row, things can get silly. Be sure to check out the video in the photo album of the crew singing "Dina Won't Ya Blow" or whatever that song is called. The two people mugging for the camera at the end of the album are ad:tech Director of Marketing Meredith Medland and ad:tech Content Director Warren Picket taking a break from preparing speaker and press passes. Below are two "film loops" from Film Loop you can join. They'll be updated with images over the three day period of the show. If you work in advertising or marketing there are two podcasts you should be listening to. The first, American Copywriter, produced by Wichita-based Sullivan Higdon & Sink creative team John January and Tug McTighe is like hanging with an insightful creative team as they riff about what's right and wrong with the industry, interview adver-celebs, skewer really bad creative, heap praise on great work, banter about pop culture and admire the return of the Doublemint twins. The chemistry between the two is flawless with each one bouncing perfectly off the other. The second, Across the Sound, produced by Jaffe LLC President Joseph Jaffe and CooperKatz & Company Client Services VP Steve Rubel, is more structured and fact-filled than American Copywriter with podcast episodes broken into segments such as a wrap up of current news and trends called Podbits, a summary of topics blogged by Joe and Steve called What We're Blogging About, a Theme of the Week section and a Winners and Losers section that examines the past week's successes and failures. The chemistry between Joe and Steve is a bit different, perhaps because they are sitting, literally, across the Long Island Sound while recording the podcast while John and Tug, who have worked together for years, are in the same room while recording. Each podcast approaches its coverage differently but the two, together, make the perfect combination of audio information about current advertising and marketing news, issues, trends and opinion. Both should be listened to, without fail, each week. Of course, it is conceivable that certain small, white electronic devices might be mistaken for those small, white pregnancy strips that covert pee into a yes or no answer, but this girl really needs to open her eyes. One of my friend's forwarded me this link. I haven't heard anything about it so I thought I'd share. Seems Subway is doing some kind of video site aimed at teens. it's called SA. The content ranges; some of it is pretty funny. And it looks like they give away Subway gift certificates and other prizes too. Yea, Jason. Of course you thought you'd share. You and all the other people being paid to spread this thing around. It's not even good enough to warrant sharing. Joe Jaffe comments that this week's Ad Age poll, which is a follow on to a study they did about blog readership at work, which asks whether employers should allow staff to read blogs at work is self-serving. I agree and commented that the whole distinction between blogs and mainstream media is overblown, "Exactly, Joe. What's the difference between reading a blog on a topic for a specific industry versus a 'regular' website for a specific industry? It makes no sense. If blogs are doing a good job of providing industry specific info, then they should be read. If mainstream media site are doing the same, then they should be read as well. If people like to read Page Six, then it should be OK to read Gawker too. There's far too much distinction being made here. Granted, there are huge differences between MSM and blogs but, in the end, they are both providing content. It should be up to the reader to decide whether MSM or blogs are doing a better job providing relevant info." "Thank you for your interest in AdAge.com's poll. The poll about blog reading at work is now closed. Watch for the results in next week's print edition of Advertising Age." WTF? The results of an online poll reported in the print edition? A week later? You must be joking. Scott, what are you guys smoking over there? Oh, we get it. You need more print subscribers. Now it all makes sense.